I have started this website for handknitted jumpers www.bexknitwear.com so I am sharing this excellent website with you. I am going to tell you how it started what I did to get to the point that I am at now. My interest in being creative started when I was very little my Mum encouraged me to be creative by showing me different things to make. She would find an old bobbin hammer 4 nails in it and show me how to do cork work it was worked on the same principle as knitting where you pass the wool over the stitch and with this the work came out through the hole in the middle like a long snake. She would cut shapes out of potatoes dip them in paint and we would do potato printing, she was a mind of information. One of the best books I was ever given as a present was a crafts book that gave me lots of inspiration, with my imagination I was off. Which has led me to this point I am at now, having knitted jumpers for myself people would ask me to knit them jumpers with names, pictures or slogans. It snowballed from there doing craft fairs and markets I have now got a website www.bexknitwear.com this hobby of knitting has grown and through my success and popularity a website was born. Please take a look I’m sure you will find something you will like. 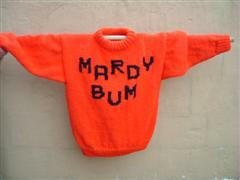 You will find original handknitted jumpers for adults and children designed and hand knitted by myself.